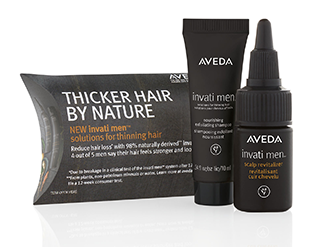 AVEDA’s Invati is designed to help men: exfoliate their hair by cleaning and renewing the scalp, thickening their hair from within, and revitalizing the scalp to help them keep the hair they have longer. High Performance Plant Based Hair care. All AVEDA products are researched and developed under a rigorous set of environmental sustainability values. AVEDA products are widely known for their use of pure plant and flower essences.